Phi Phi diving is a fairly long but pleasant journey for us but it’s worth it. 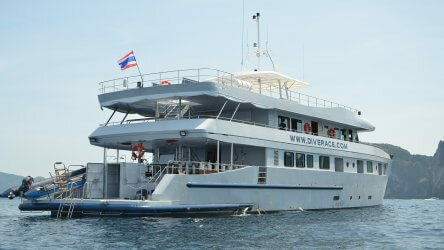 It’s a leisurely 2hr 30min journey from Phuket but that’s not an issue on our comfortable dive boats. Sometimes we’re fortunate enough to see a pod of dolphins following the boat and we’ve even seen whales on the journey out. 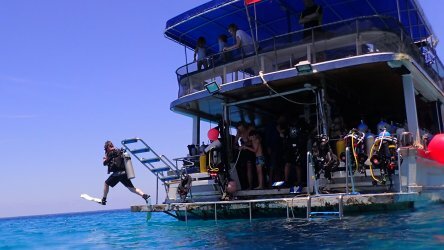 Even before you get in the water you’ll be already impressed by the dive site. Twin limestone karsts topped with tropical foliage jut out of the water. 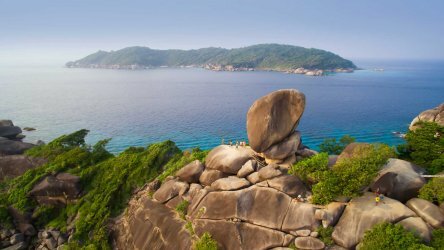 Koh Bida Nok is the outer island and it’s sister site Koh Bida Nai the inner island. They sit just a couple of hundred metres apart separated by a 30 – 35m deep channel that can sometimes have strong current. The topography of the dive site varies, at the south end you have a shallow sandy bay, a steep wall at the North end, a gently sloping coral reef on the west and sand and boulders on the east. 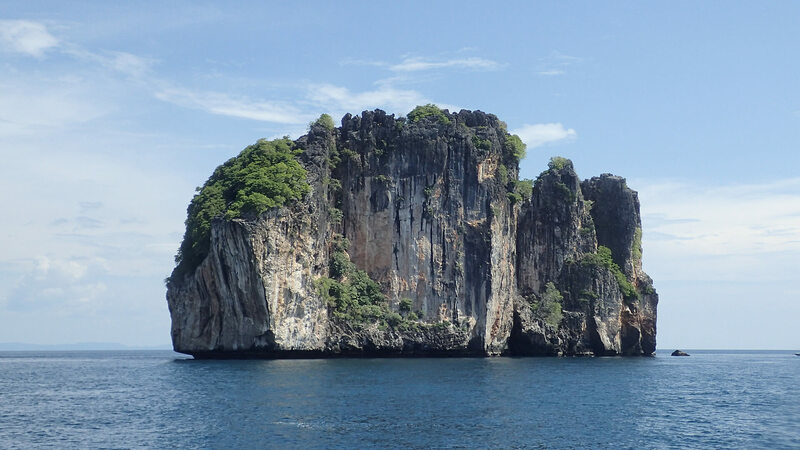 This variety of environments attract many different species and makes Koh Bida nok a superb dive site. The favoured side is the west. Either starting from the North wall or the South bay. Huge schools of yellow snapper and juvenile barracuda hang around the South West corner and are great fun to gently swim through. The schools slowly part and then regroup as you make your way past. Groups of golden and bluefin trevally are always in attendance waiting for an individual to leave the safety of the school. 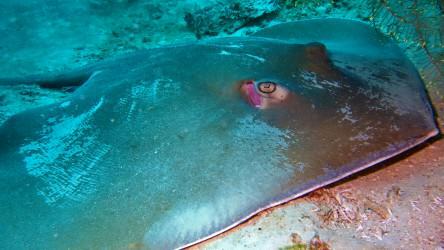 Reef octopus and hawksbill turtles are commonly spotted and kuhl’s stingray and cuttlefish hide in the sand in the South bay. The walls and rock formations hide all kinds of critters. Harlequin shrimp, painted spiny lobsters, ornate ghost pipefish and tigertail seahorses have all been seen here. In the shallow areas all around the island you have a good chance of seeing some blacktip reef sharks. Occasionally leopard sharks rest in the deeper areas. There’s a very pretty coral garden that we call the finger on the west side of the bay. It’s worth spending a bit of time here looking in amongst the corals to see what you can find. Koh Bida Nok is a great all round dive site and definitely the one to visit if you only have a limited time for scuba diving in Phuket. 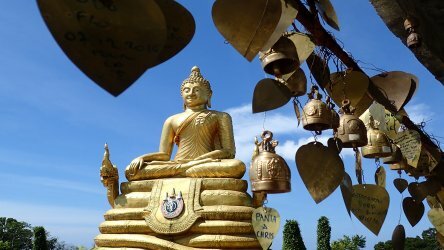 We visit Phi Phi on Sunday and Wednesday so contact Local Dive Thailand to arrange a great day out.